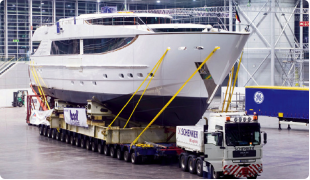 Save Money on transporting your boat! We at Secure Auto Shipping want to earn your business and your trust, by providing you with our customized services for land transportation. Our goal with every transport is to create a life-long relationship with our customer, and we do that by being the best boat transporters and movers out there! This is what makes us your best source for all your transportation needs. Regardless of your Yacht or boat size, our experience and professional crew will strive every day to provide the services that are relevant to helping you achieve your expectations quickly, and efficiently. We appreciate the opportunity to offer you our unique boat transportation services, designed exclusively to meet your needs. Call (844) 228-9510 —24 hours a day! No Answer, we call back in 30 minutes or less so leave a message! Fill out the form and submit it for your instant quote.